Max Power needed a set of sponsor decals for their Project Slide Yaris in time for the Modified Nationals Show and being pleased with the 'Max Power FTMFW' decals we supplied a few weeks earlier the boys at the UK's largest modified car magazine placed a call to us and the job was on. 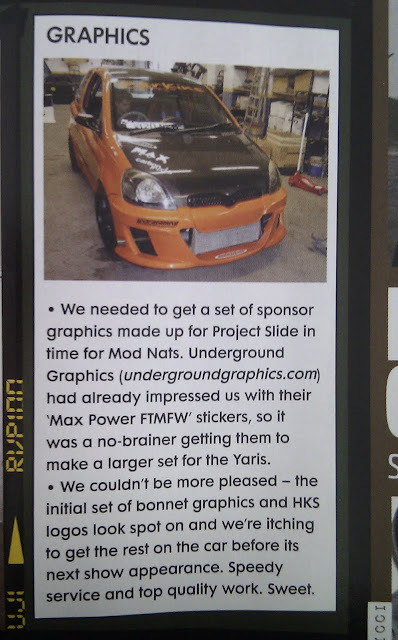 We caught up with the boys from the magazine at the Scottish Modified Show in Edinburgh but didn't realise there was an article in the magazine until a few text messages started arriving when it came out a few weeks later. A quick blast to the 24hr BP Station and there it was - you can just make out the Underground Graphics logo on the bumper just below the driver's headlight. 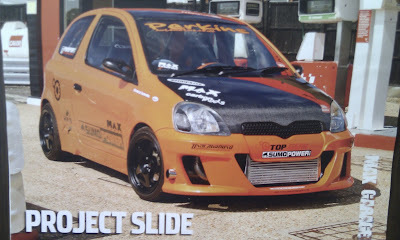 Article from the September 2010 issue of Max Power.